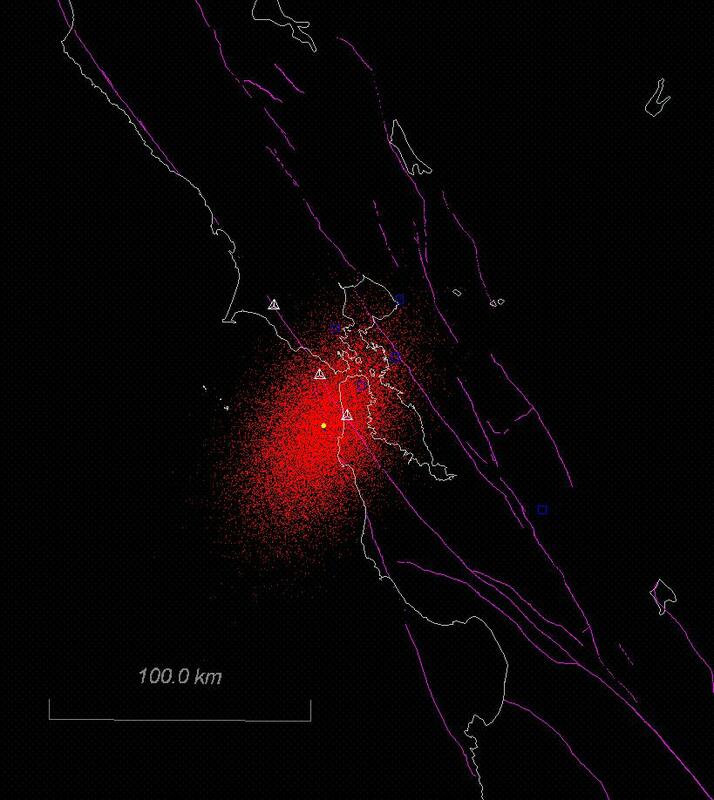 Lomax, A., (2005), A Reanalysis of the Hypocentral Location and Related Observations for the Great 1906 California Earthquake, Bull. Seism. Soc. Am., 95, 861-877. We determine probabilistic hypocentral locations for the foreshock and mainshock of the Great 1906 California earthquake through reanalysis of arrival-time observations in conjunction with modern velocity models and advanced event location techniques. We obtain two additional observations for the mainshock and one for the foreshock that were not employed in previous location studies. 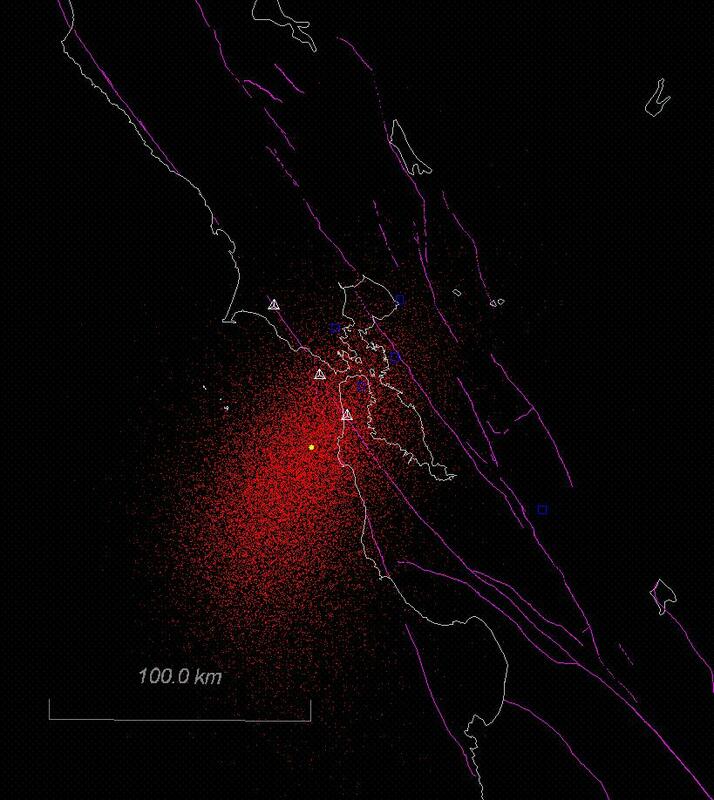 Using a robust likelihood function for event location, we generate a usable subset of the predominantly unreliable teleseismic readings and determine new wave-type identifications for some of the local and teleseismic readings. 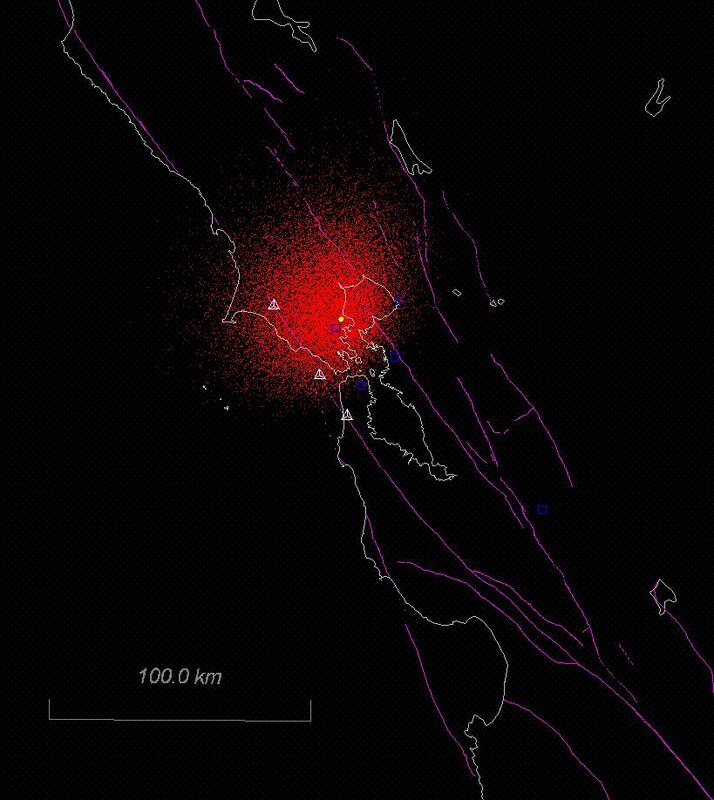 Our locations are much better constrained than those of earlier studies, even though we do not assume that the epicenter lies on the San Andreas Fault, as did previous authors. 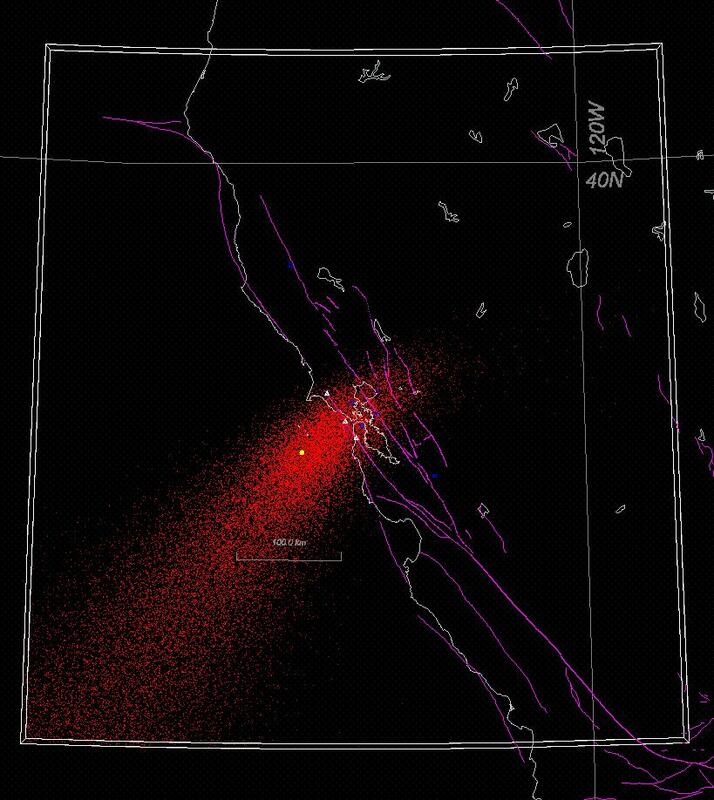 We confirm the conclusions of earlier studies that the local and teleseismic arrival-time observations can be explained by a single foreshock focus and a single mainshock focus on the San Andreas Fault, and that there is no single, unique hypocenter that satisfies all available local observations. 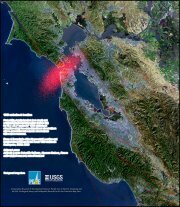 The maximum likelihood point (Lat: 37.78°, Long: -122.51°) for our “preferred” mainshock location indicates a hypocenter to the west of San Francisco, close to the San Andreas Fault zone. 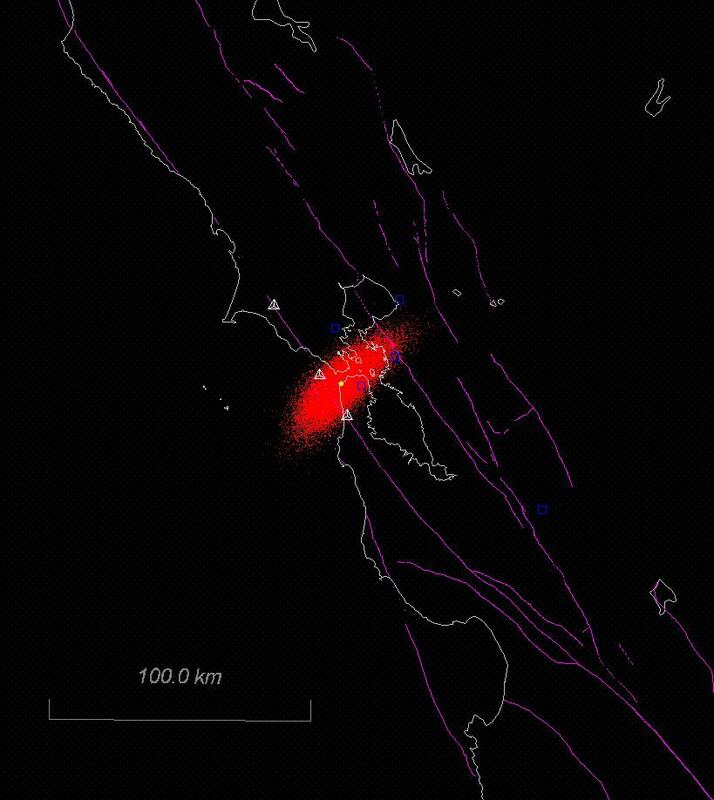 This hypocenter has a 68% confidence error of about ±8 km parallel to the San Andreas Fault and about ±24 km perpendicular to the fault, and a depth in the mid-crust of about 12±7 km. The closest point on the San Andreas Fault to this hypocenter lies about 10 km to the northwest of the widely accepted mainshock epicenter of Bolt (1968). 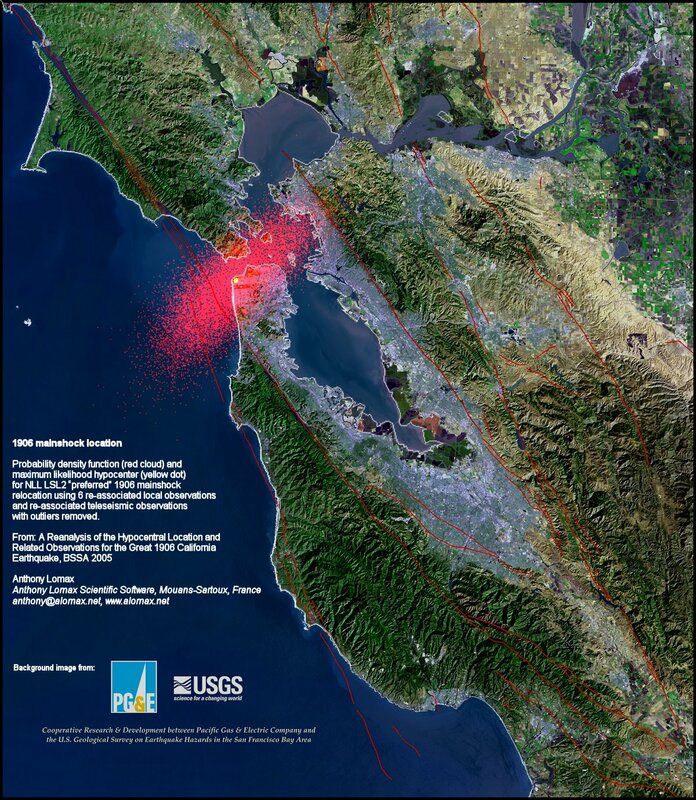 Our mainshock location is consistent with the association of initial rupture of the 1906 mainshock with a dilatational right-bend or step-over in the submerged San Andreas Fault system offshore of the Golden Gate. 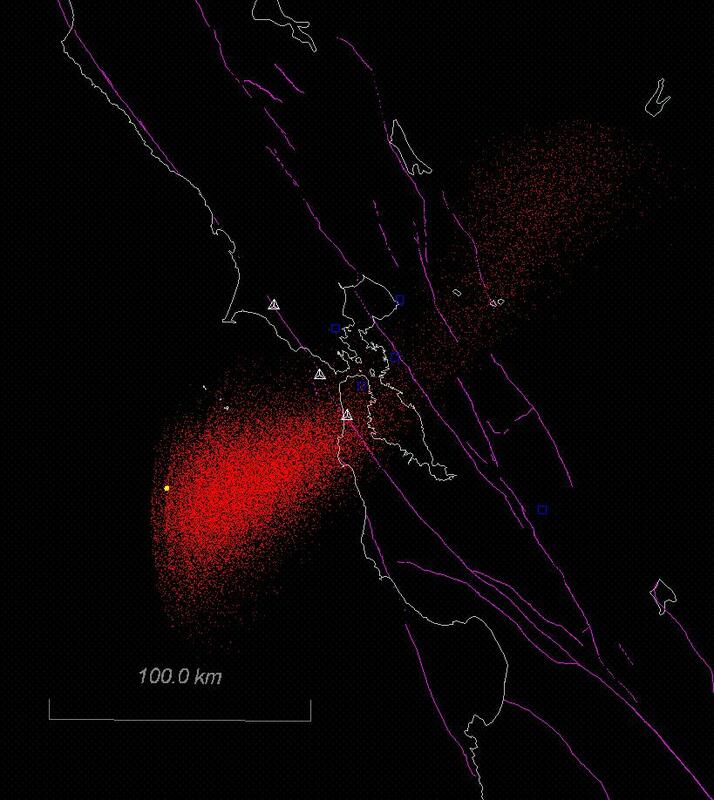 Our foreshock location is less well constrained than our mainshock location but is consistent with the foreshock hypocenter being at the same location as the mainshock hypocenter. Each Java visualization and screen image shows the NLL relocation for the corresponding figure in the printed paper. The NLL location pdf is represented by the red cloud of points and the NLL maximum likelihood solution is shown as a yellow dot. The box with constant latitude/longitude limits shows the NLL Oct-tree search volume. Squares indicate all local observation sites used in this study. Triangles show the Reid (1910) "Golden Gate" foreshock and "Olema" mainshock, the "1957" mainshock of Bolt (1968), and the Boore (1977) "Golden Gate" mainshock (see Figure 1 in the printed paper for details). Violet lines show principal faults. 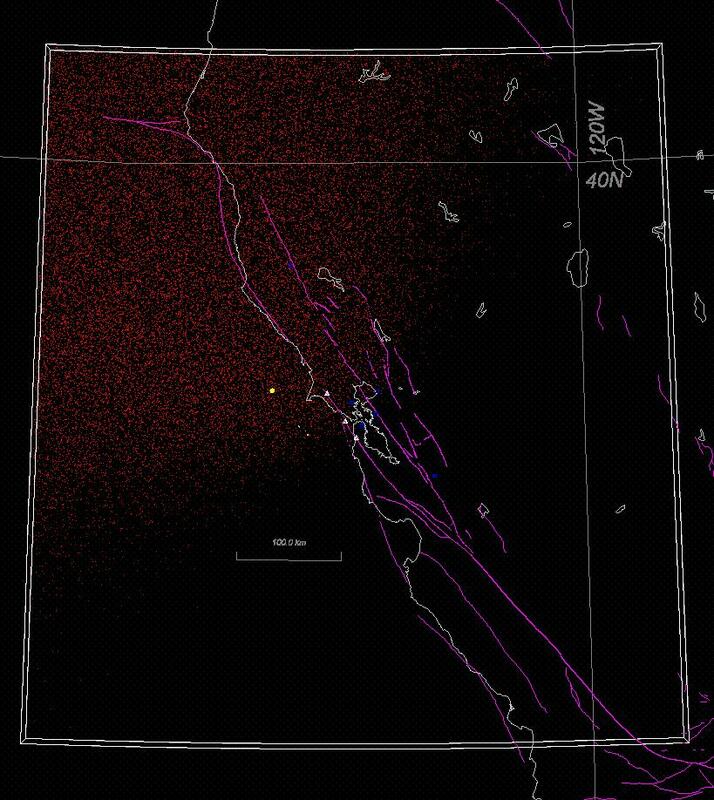 Figures 3-12 - All relocations (click on the Next button in Seismicity Viewer to see each location in turn). To use multiple viewers simultaneously, open each Figure link in a new browser window. To prevent line removal when rotating to cross-section view, select the Seismicity Viewer menu option View->GlobalTransparent. To view detailed phase information, select the Seismicity Viewer menu option View->EventInfo. For more information, select the Seismicity Viewer menu option Help->Help. Bolt, B.A., (1968). 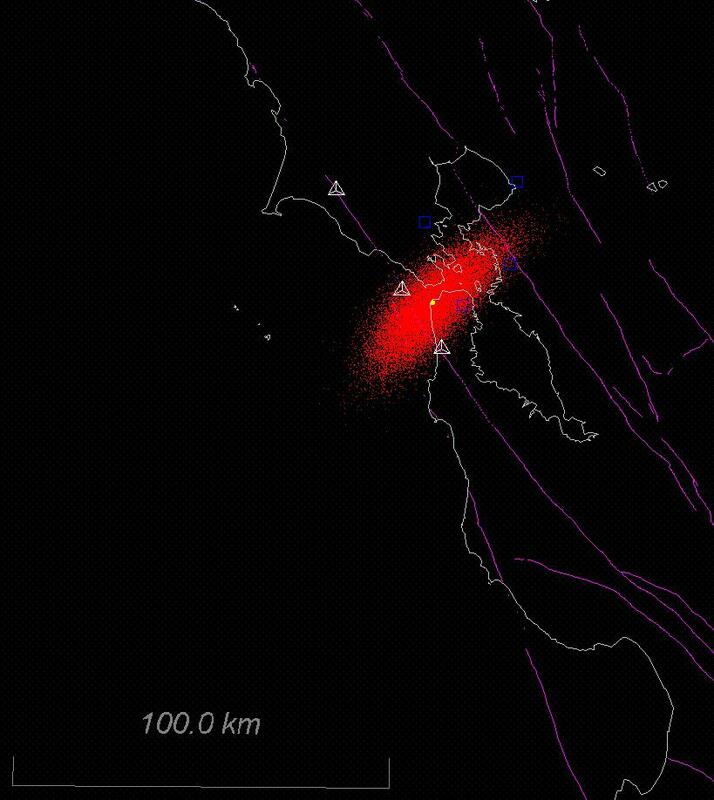 The focus of the 1906 California earthquake, Bull. Seism. Soc. Am. 58, 457-471. Boore, D. M. (1977). Strong motion recordings of the California earthquake of April 18, 1906, Bull. Seism. Soc. Am. 67, 561-576. Reid, H. F. (1910). 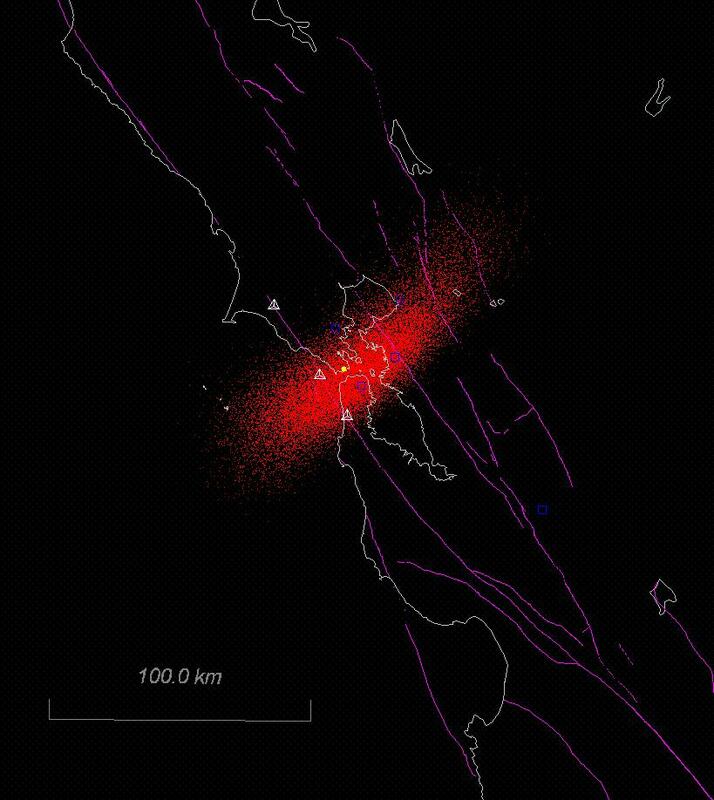 The Mechanics of the Earthquake, Vol. II of The California Earthquake of April 18, 1906, Report of the State Earthquake Investigation Commission, A.C. Lawson, Chairman, Carnegie Institution of Washington Publication 87, 192 pp. (reprinted 1969).